BlackBerry Messenger is one of the few killer products that RIM has to offer, so it's really not too surprising that the company is pushing for apps to get BBM integration. According to RIM, there are already 800 BBM-integrated apps in the BlackBerry App World, and the company has just announced a few more, and these are some big names. Over the next 10 days, updates will be coming to BlackBerry App World, BBM Music, BlackBerry Travel, and the official Twitter and Facebook apps for BlackBerry. Facebook and Twitter will each be getting options to update your BBM Personal Message automatically when you share a post on either service, or simply share posts to BBM contacts. Similarly, BB Travel will be able to automatically share your status with BBM contacts as you move through your travel itinerary. 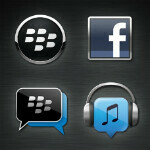 BlackBerry App World will update your BBM when you install new apps. And, while BBM Music already has BBM integration (hence the name), it will also receive options to mark favorites on your songs or playlists to help give better recommendations. BlackBerry Messenger itself is also getting an update to version 6.2, which will improve BlackBerry Tag (NFC) integration, make sending voice notes faster, make updating your personal message easier, and add animated avatars. Not a bad set of updates all around. Even if not too many BB users actually use the official Twitter app, it should help make BBM better, which can only be a good thing for RIM. RIM may be on its way down, but BBM is still a pretty valuable product if only for its dedicated user-base. All these positive developments show just how good the BlackBerry OS system is and why it must survive. More power to BlackBerry!